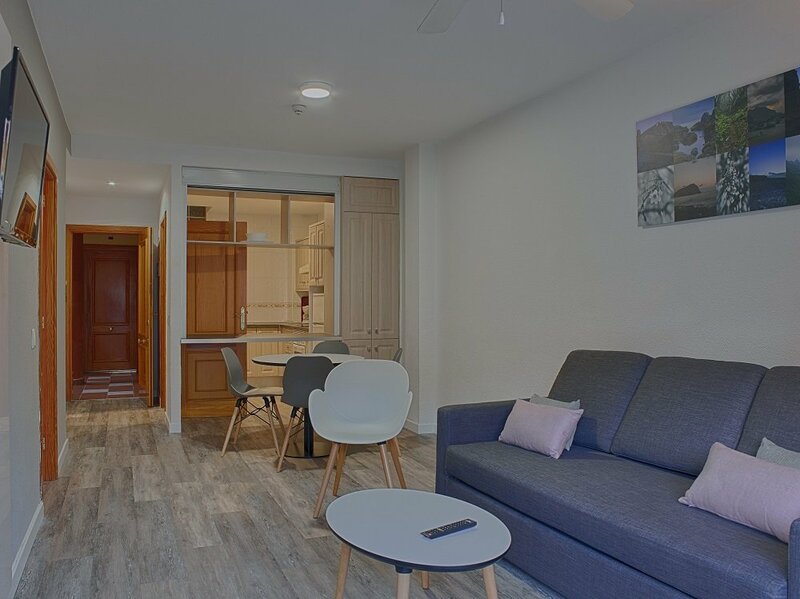 Discover your different accommodation options with the 115 apartments in Las Americas of the Coral Compostela Beach Golf Apartments. 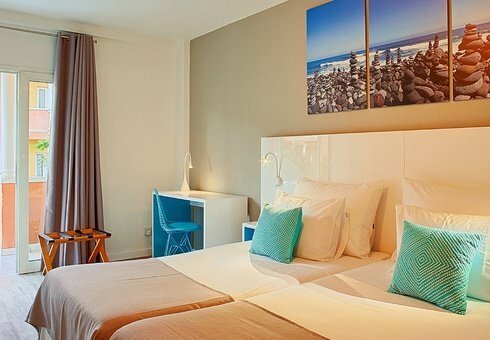 On the official website of Coral Hotels we show you all the accommodations available so that you can book your customised apartment on the south of Tenerife at the best price. The Loft Apartment, 40m2, includes a fully equipped kitchenette with 2 rings and a large modern shower. 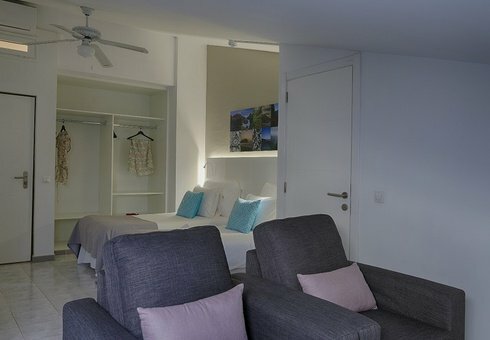 Plasma TV and have the same facilities of the 1b edroom apartment but without the separate room. Please note that this apartment is situated on one of the top floors and does not have a balcony. It has a skylight and easy access to the sun deck and shared terrace area. 1 Bedroom Apartment, with 61 m2 sized and designed with a modern and tasteful style with vinyl-wooden flooring, designer furniture and LED lighting. It is composed by one separate bedroom, a lounge with a flat screen TV including satellite channels, a fully equipped kitchen with 4 rings, kettle, toaster and coffee machine, and a bathroom with a bathtub. Additionally there is a direct phone, safety deposit box, Wi-Fi connection and ceiling fans in lounge and bedroom. 1 Bedroom Apartment with private garden, 80 m2 sized (including private garden). 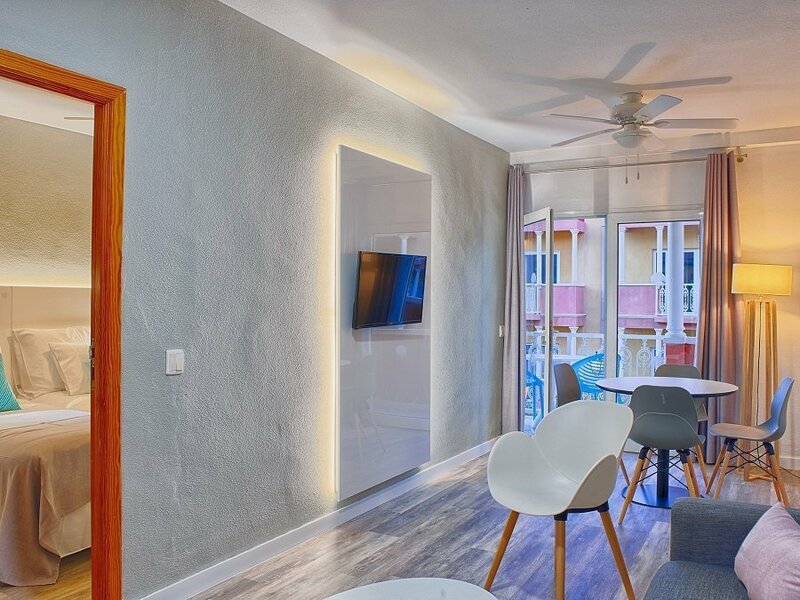 It includes the same facilities as for the Standard 1 Bedroom Apartment, but additionally it incorporates a small private garden with sunbeds, where guests can enjoy their privacy. All private gardens have been recently covered by artificial grass for the delight of our guests. 2 Bedroom Apartment, 80 m2 sized. These units have 2 separate bedrooms, one of which includes an “en suite” bathroom with bathtub. The remaining facilities are equal to the Standard 1 Bedroom Apartment (including a second bathroom with bath tub).